Air Force Academy Superintendent Mike Gould will become the 234th person inducted into the Order of the Sword. The enlisted corps of the academy invited Gould, who has served as superintendent since June 2009, to join the order during a Dec. 13 ceremony, according to academy public affairs. 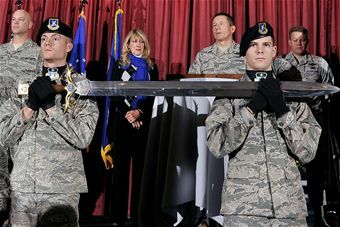 The award was established by Military Airlift Command’s enlisted corps in 1967 and is presented to individuals whom the noncommissioned corps chooses to honor. It also is the highest recognition enlisted airmen can bestow upon a senior leader, according to the academy. Gould is scheduled to be inducted March 19.